This entry was posted on April 29, 2014 by sandeeadmin. This week we signed a deal to become the Official Fight Glove Provider and Sponsor of one of the best MMA Fight Promotions anywhere in the UK, North West Based, Full Contact Contender which goes by the name of FCC, for those who are fans already. FCC has established itself as one of the most sought after MMA shows to fight on. Events are nearly always packed to the rafters from its base at the prestigious Premier Suite of the DeVere White Hotel at the Reebok Stadium, Bolton, Greater Manchester. Shows have seen gates in excess of 1500 people and FCC is developing a real following after 9 fantastic shows. FCC Started life as an Amateur MMA Event, with a chance for up and coming MMA Fighters to compete in a properly run show with great match ups and all the atmosphere and prestige you get with a big professional event. Now after 9 Events, FCC still has mainly Amateur fighters on its stacked fight cards, but also sees mouthwatering Pro MMA Fights topping the bill on each event. FCC 9 on 22nd March saw Pro MMA Fighter and SANDEE sponsored Athlete Pietro Menga, take the FCC European Flyweight Belt taking him to 11 straight wins in MMA. Menga who has fought for FCC Three times now and is typical of the kind of exciting fighters and fights FCC promotor Adam Teh puts together, often bringing over exciting top ranked European fighters such as Menga's last opponents Sotir Kichukov (Bulgaria) and Artemij Sitenkov (Lithuania). Its this successful mix of some of the best up and coming domestic talent together with top level European Fighters that makes every FCC something special. 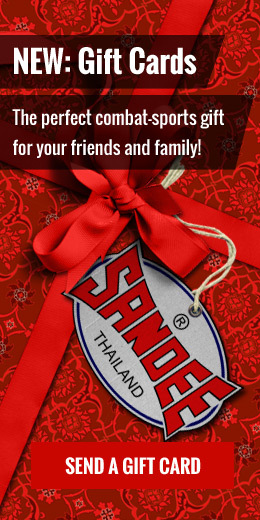 FCC promoter Adam Teh said “We’re really excited to work with such a well-respected brand as SANDEE. Their products have been produced in the same factory in Thailand for over 30 years, and as a brand they have always remained true to their values as supporters of grass roots combat sport. I feel that those values reflect the ethos of Full Contact Contender, as we continue to seek out up and coming mixed martial artists at the grass roots level”. SANDEE have been an established tried an tested product when it comes to an MMA Fight Glove, used for many years by Liverpool based MMA Promotion OMMAC, almost every successful fighter has worn a pair of SANDEE pro MMA Fight Gloves at some point in their fight careers. For FCC which features many fights under Amateur rules, FCC will be using the familiar SANDEE MMA Sparring Glove seen in MMA Gyms up and down the country. FCC fans will also be also be access some great exclusive discounts through FCC's affiliated media platforms.